The Bulldogs debuted new uniforms in 2015 that were updated versions of the DWS 100 uniforms that were worn in 2014. Unfortunately, they were not so much updated as simply transitioned to the newer Adidas Primeknit template. The black outlines that were a part of the throwback to the 90's uniforms, as well as the awful oversized M-State pants logo that was only supposed to be worn for one game, became permanent fixtures of the Bulldogs' regular uniforms. It would be nice if Scott Stricklin and some of the other people in charge of the Bulldogs' football uniforms took some initiative and took our uniforms from an in-cohesive mess with potential to a set that fits in perfectly with the other classic uniforms in the SEC. The first change that needs to be made to the Bulldogs' uniforms is to remove the black outlines from the collar, numbers, and stripes. They worked and made sense on the original DWS 100 uniforms, because they were throwbacks to late 90's uniforms that the Bulldogs had success in under Jackie Sherrill. In a full time uniform, there is no need for black outlines. There is no black on the pants or helmet; outside of alternates, black is not a color that is or should be used by Mississippi State athletics. The black muddles things a bit on the maroon jersey, but it really messes thing up on the white jersey. The outline on the numbers and stripes blend in with the maroon and make them fatter and darker. This was really noticeable in the game at Missouri last year, when in the rain the Bulldogs wore a white helmet with a bright maroon logo with a silver outline. Removing all black from the Bulldogs' jerseys would be a huge step in the right direction. Casual viewers may not notice the black outlines, but I'd hate to see a stat showing many times people watching a Mississippi State game have pointed out how terrible our pants our. Adidas slapped the large oversized M-State logo on the pants of the DWS 100 uniforms, which, keep in mind, were originally only supposed to be worn once. Instead in removing it in 2015, the Bulldogs actually added it to new pairs of maroon and black pants. How hard would it be to put stripes on the white and maroon pants that match those on the gray pants and jersey shoulders? The brightest spot of the Bulldogs' 2015 uniform lineup was the addition of gray pants with the same striping pattern as those worn in the late 80's. 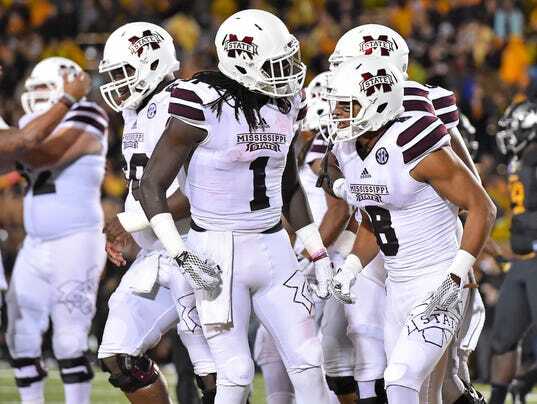 A great alternate look, especially on the road, the gray pants were the best the Bulldogs had last year, considering that the white and maroon pants had the oversized M-State logo. However, the pants are not perfect. On the left hip, there is a small all-white M-State logo. Having a logo there is fine, but the monotone M-State logo is seemingly being phased out lately; it was removed from the helmet last year. It would make more sense, both in connection with the helmet and the M-W-M stripe on the pants, if the logo used on the pants were the version with a maroon M and white banner. This would be a minor change in comparison with the other two, but it needs to be made in order to maintain consistency. Will any of these changes happen? Probably not. 2015 was the first year of what is generally a three year uniform cycle. These are all changes that really should have been made prior to last season. Still, it is disappointing to see that we are on the hinges of a great uniform, but because of a few bad decisions are stuck with a bit of a mess. There's always a chance that the people in charge will notice this and indeed make a change. Get rid of the oversized M on the pants and go with stripes as shown above. DO NOT go back to teh single wide stripe on the pants, but have the stripes (plural) on the pants relate to the stripes on the 100th anniversary jerseys. Then leave the uniforms alone.